Reason to Join a Local CGOA Chapter #1: Local NatCroMo Events! 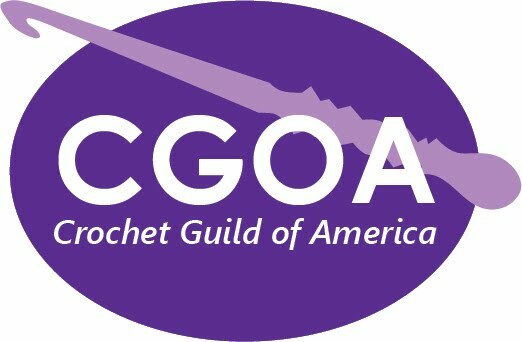 Welcome to my blog series on reasons to join a local CGOA chapter! Back in January I joined the Crochet Guild of Prince William County for the first time, and I couldn't believe what I had been missing! The opportunity to take part in local events for National Crochet Month! In addition to setting up crochet display cases at the local library, my local chapter set up a large booth at the local mall to entice passersby to learn about crochet. Guild members Rhonda Reese and Lauren Capehart greet curious shoppers. Welcome to Part 3 of our Across the Board CAL! For those of you just joining, everything you need to know about the CAL can be found on this post. This segment is brought to you by Unicorn Fibre, who also sponsored the Diamond Trellis Strip. If you missed your chance to win the Unicorn Baby Gift Set, here's your second chance to win! The set contains 4 oz each of their Fibre Wash, Power Scour, and Fiber Rinse products, all topped with a sweet baby unicorn plushy. This prize is being shipped directly from Unicorn, and is available to be shipped in the USA only. Enter the giveaway through the Rafflecopter below for your chance to win! Entries will be accepted from March 28th through April 10th, 2016, and a winner will be selected on Monday, April 11th. Many of our members have started (even completed!) this segment's strip already, but for those of you who haven't, this segment's strip is Squares of Happiness by Tammy Hildebrand, former vice president of CGOA and owner of Hot Lava Crochet! "You can certainly see Tammy's love for bright, vivid, contrasting colors in the strip she has designed this year using jade, lavender, coral, and shocking pink. Tammy is also well-known for her love of motifs and the join-as-you-go technique, which eliminates the need to sew all your motifs together at the end. Nobody has time for all that sewing, not to mention the extra ends you'd have to weave in. So make Tammy's strip and learn how great joining-as-you-go can be." If you've been avoiding granny square projects because of the sewing involved, then this is the strip for you! Joining as you go eliminates much of the tedium typically involved with motif projects. Find the pattern on page 6 of the Across the Board 2015 booklet. *Special thanks goes out to Red Heart for donating the yarn that was used in the pattern book! I'm Marie Segares from Underground Crafter and this is the third post in a monthly series for CGOA Now! where I shine a spotlight on a CGOA member and share a bit of her story with an interview. In this month's post, I'm talking with Jessie Rayot from Jessie At Home. Jessie is a crochet and knitting designer, blogger, and YouTuber. Jessie has a background in costume design and studio art which influences her design process. I had the pleasure of meeting Jessie in real life at Stitch N' Pitch last year, and since then we've become pals. We even co-host a monthly knitting (gasp!) link party together. (If you also knit, check it out here.) 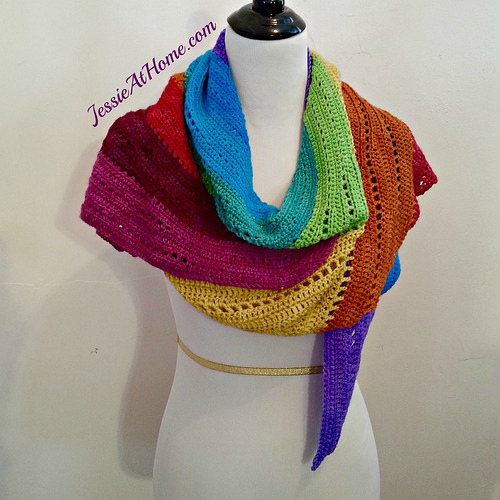 Jessie can be found online on Craftsy, Etsy, Facebook, Google+, Instagram, Pinterest, Ravelry, Twitter, and YouTube. All images are used with permission and are © Jessie Rayot/Jessie At Home unless otherwise noted. 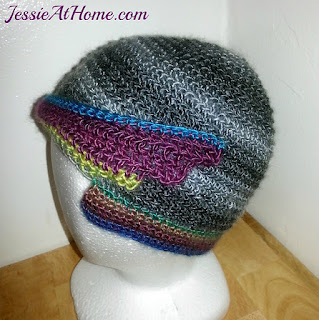 Jessie Rayot wearing her Emily's Super Slouchy Hat, a free knitting pattern. Jessie also has a free crochet pattern version. Jessie: I first started to crochet when I was 8 or 9. My great grandmother taught me. I wrote about it a few years ago for NatCroMo. You can read the whole story here. Amalthea, a free crochet shawl pattern by Jessie Rayot. Jessie: I started designing costumes in high school. I went on to earn a BFA in Costume Design from The Theatre School at DePaul University in Chicago. I worked as a costume designer and costume shop manager until I was 28. I had always kept my love of crochet with me, and I very rarely used patterns, I just improvised. Shortly after my twins were born, I started my blog, Jessie At Home, as a way to keep my family up to date on the girls. 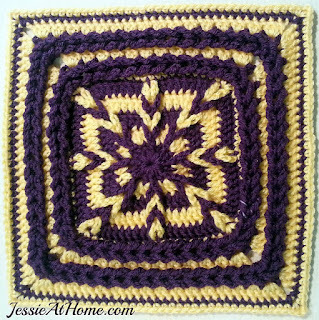 Eventually I started adding crafty posts, and in October of 2009, I posted my first written pattern. Retro Ornament Throw, free crochet pattern by Jessie Rayot for Red Heart. Image © Jessie At Home. Jessie: I joined CGOA in 2013. I love so much about it. I think my favorite thing about the CGOA is the opportunities it has opened up for me thanks to the comradery it fosters. It’s wonderful to be part of an organization that encourages working together, and helping each other! Flight Hat, free crochet pattern by Jessie Rayot. UC: How do you celebrate National Crochet Month? Jessie: I usually try to find something fun to do on my blog. This year I'm planning on LOTS of product reviews. Most of the reviews will be for products that will be included in the 2016 Yarn and Wine Tasting next month. 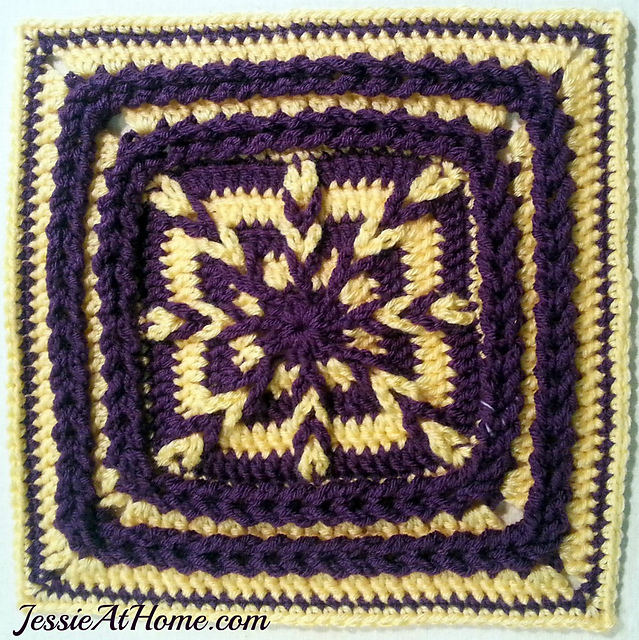 Joseph's Puff Stitch Blanket, free crochet pattern by Jessie Rayot. Jessie: Something that is easy to memorize, but not so simple it becomes tedious. My Skylark in Wonderland pattern is an easy to memorize 4 row repeat, and I found it quite relaxing to make! Skylark in Wonderland, free crochet pattern by Jessie Rayot. Jessie: Something with new or difficult stitches, learning new skills. Tamara's Kismet Square is one of my most challenging patterns, which is why it includes videos and photo to help you along. 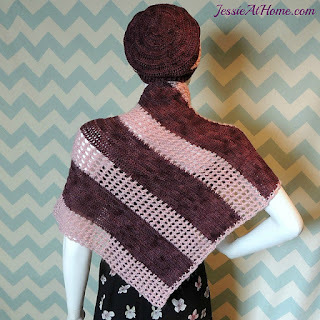 Tamara's Kismet Square, free crochet pattern by Jessie Rayot. Jessie: Cowls, hats, scarves… things most people will actually use. Several years ago I designed a set of winter patterns that I used to make nearly all of my Christmas gifts. If I can figure out something that is perfect for the person I’m gifting it too, that’s even better! Basically, I love giving what will make the recipient happy. 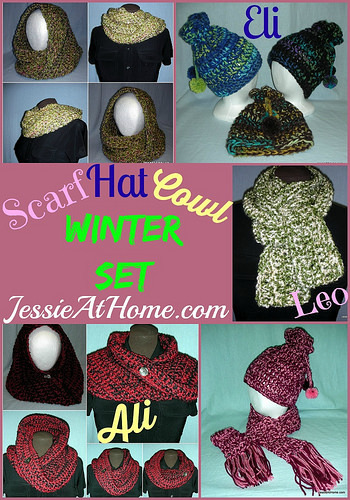 Eli, Ali & Leo Winter Set, 6 free crochet patterns by Jessie Rayot. I’m really excited about the Yarn and Wine tasting I'm running at a friend's vineyard next month, and about all the conferences and trade shows I'm attending. Thanks so much, Jessie, for sharing your love of crochet with us. Welcome to Part 2 of our Across the Board CAL! It has been so much fun seeing the color combinations everyone chose for the Diamond Trellis strip, and even more exciting to hear that CGOA has picked up some new members this month! For those of you just joining, everything you need to know about the CAL can be found on this post. This segment is brought to you by Ancient Arts Fibre Crafts, a company who specializes in exotic fibers and unique, hand-dyed yarn (check out their Meow and Woof collections!). They are donating not one, but two skeins of their never-before-seen Reinvent yarn for this segment's giveaway. Enter the giveaway through the Rafflecopter below for your chance to win! Entries will be accepted from March 14th through March 27th, 2016, and a winner will be selected on Monday, March 28th. This segment's strip is Skipping Stones by Susan Lowman, former secretary on the CGOA Board and former co-chair of the CGOA Masters Committee (and current Professional Member of CGOA). "Susan Lowman is well-known for her work with the Wiggly Crochet technique. If you've never tried it before, you're going to love it. You start by creating a mesh background then crochet your strips into that mesh. Susan has chosen to arrange the colors of rouge, lavender, and shocking pink so her strip has a very free-flowing feel that is reminiscent of ripples in a pond." This is a fantastically textured strip that showcases the three-dimensional capabilities of crochet. The pattern starts on page 4 of the Across the Board booklet. Hey, CGOA people! 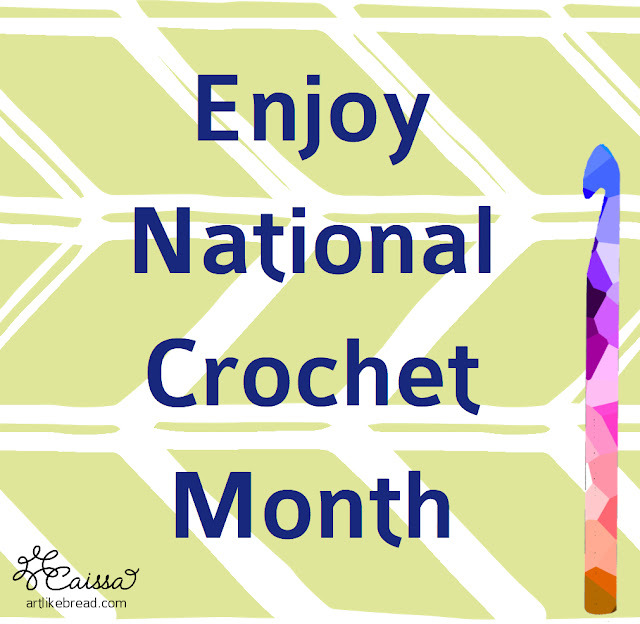 Are you as excited as I am for National Crochet Month? I am sure you're aware of all of the different ways we can celebrate crochet this month. If not, check out our CGOA Across the Board Crochet-Along with fab prizes, this past post with some great ideas, or skip on over to Crochetville and jump on their blog train! I am really excited for today's post because today's post is all about YOU! Each month I'll post a question here on the blog. We'll then post it on our facebook page, where YOU can share your answers and photos (if applicable). During the last week of the month, I'll round up some of the shining comments and images. Then I'll post them here on the blog and we can all read about what others are up to! I will also present the next question at that time. Sound fun? 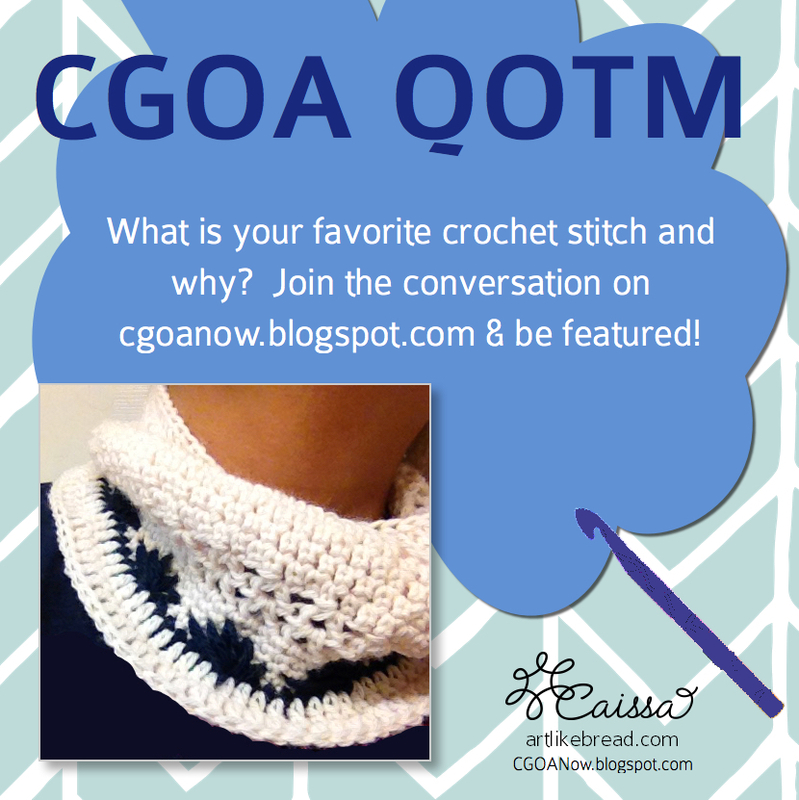 So the question of the month (QOTM) this time is What is Your Favorite Crochet Stitch and why? I'll begin the fun by answering. Although I don't necessarily use it that much, I love the Extended Single Crochet. The reason I love it is because I just used this stitch in a project and it was elegant. It's drapier than single crochet, as simple as double crochet, and produces a beautiful fabric when worked in the round. You can see my new favorite stitch at the top of the above photo. I am extremely interested in learning about the stitches that our members love, so let's keep the conversation going. Please tell me your favorite stitch and why! Feel free to link to a tutorial or great book/pattern resource featuring your stitch! Please leave a comment here on the blog, on our facebook page, or in any of the various forums I'll be checking. If you want your tweet or gram to be found, please hashtag #CrochetQOTM on twitter or instagram.